Forests are so much more than the “lungs of the earth.” The balance of all that allows life to flourish on Earth is dependent upon the function of forests, for more reasons than you may know. Global forests are in fact the mechanism that absorbs much of the excess carbon emissions and releases oxygen into the atmosphere. Deforestation and forest degradation contributes as much as 30 percent of global greenhouse gas emissions each year–rivaling emissions from transportation globally. The importance of tropical forests because of their size and geography, including their ability to store carbon and thereby slow climate change, cannot be emphasized enough. At the 2018 Global Climate Action Summit, Dr. Goodall and JGI are taking a stand – the forgotten solution is seeing the trees for the forest, and we must do something to protect these environments before it is too late. Human activity, including unsustainable agricultural practices, factory farming and human development, is contributing to shrinking forests across the world. Chimpanzee habitats, and the habitats of other great apes like orangutans, are increasingly being converted into hot spots for unsustainable industrial agriculture. It’s a situation which creates a reinforcement loop of destruction, as deforestation also reduces biodiversity of a variety of species (many of which are essential seed dispersers maintaining the health of forests – like chimpanzees) therefore contributing even more to forest loss. But the beauty of identifying this problem is that effectively countering it, is actually a huge climate change solution. 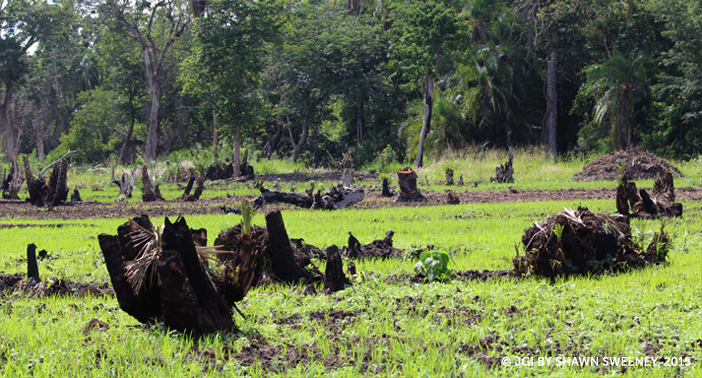 Preventing the continued loss and degradation of forests and supporting sustainable and appropriate restoration could contribute to one-third of total climate change mitigation required by 2030. Restoring just 350 million hectares of forest could potentially sequester (offset) 1.7 gigatonnes of carbon dioxide equivalent annually (IUCN). 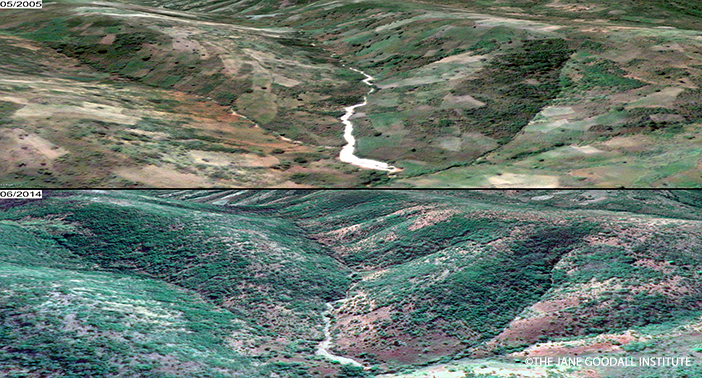 What is JGI doing about deforestation? We work with local communities through land-use planning to designate protected forest reserves and outline specific agricultural areas that maintain forests while allowing individuals to grow their income sustainably. We also provide training and resources to establish sustainable livelihood options – like agroforestry and beekeeping – which reduce the need to illegally log for personal use or for sale, and protects chimpanzees by keeping people from entering forests or illegally hunting for bushmeat. JGI also works with local and international governments to support policy which emphasizes sustainable development. Through the continued development of scientific technologies and conservation science insight, JGI increases the knowledge, accessibility and understanding of community-centered conservation to protect chimpanzee habitats and also mitigate climate change. By utilizing this knowledge, local leaders can accurately map their region to better understand the state of the forests and ways to better restore and protect them. These advancements help JGI democratize access to information on forest change enabling local stakeholders to identify conservation priorities and develop solutions. The result is more timely, effective and informed decisions. User friendly tools developed by JGI and other partners include multiple forest monitoring digital applications. These include the ability to assess overall habitat quality using high resolution satellite imagery with the Chimpanzee Habitat Health Index, and near real-time deforestation alerts and ground truthing with mobile apps such as the Global Forest Watch Forest Watcher. 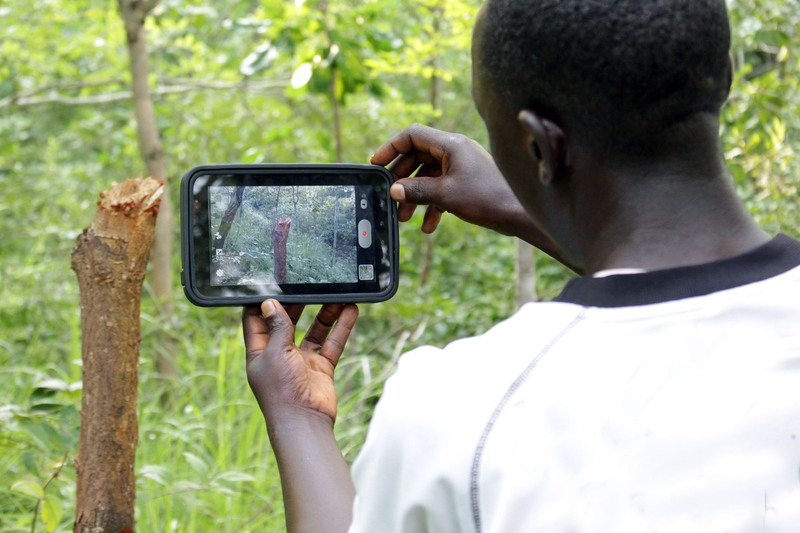 Become a forest watcher by downloading the forest watcher app, designed in partnership with JGI, the World Resources Institute and Global Forest Watch. Learn more about the app here! Young people who participate in JGI’s Roots & Shoots program around the world often identify deforestation as a major issue in their communities, and plan service projects to help restore nearby forest habitats and/or advocate for the protection of global forests. Learn more about getting started on your very own project to protect forests here, start with a one-click, and/or join our Facebook group to share ideas and much more. 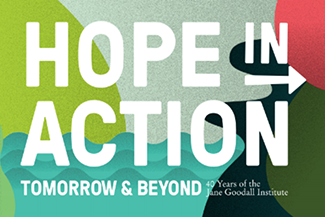 Dr. Jane Goodall alongside the Jane Goodall Institute, uses her voice and platform to support larger environmental objectives promoted by the UN’s sustainable development goals. Dr. Goodall is doing just that at the 2018 Global Climate Action Summit. The summit will cover a range of issues such as achieving healthy energy systems, inclusive economic growth, sustainable communities, land and ocean stewardship, and transformative climate investments. The summit allows international and local leaders in climate action to gather and discuss sustainable innovations for climate change, celebrate achievements that have been made for the environment, and conceptualize ways to continue making strides toward a more sustainable environment. During her lecture, Dr. Goodall will discuss issues pertaining to deforestation including . 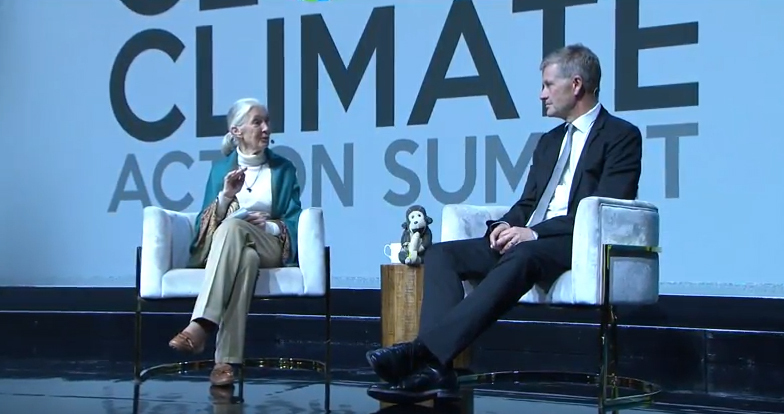 Follow along @janegoodallinst #GCAS2018. Jane’s message of hope on this issue is clear: The urgency of combating threats posed by climate change is very real. We each have a responsibility to other people, other animals and the environment and it is up to each of us as compassionate citizens to make decisions every single day that reduce harm and protect life. Protecting forests cannot continue to be the forgotten solution. Previous ArticleIntroducing the Fund II Foundation Roots & Shoots National Fellows!